The 45s arrived at Reverb Ranch today! The 45s are coming in from Nashville! The covers are coming in from Toronto! The 2nd test pressings arrived, and are much superior to the first ones. United says it’ll be about 6 weeks for the final project to arrive. Time to order the covers, and set up the digital downloads, as this release comes with another 4 tunes not on the vinyl. Test pressings have been sorted and processed from Miami, and are now on their way to Canada. Should be here soon. 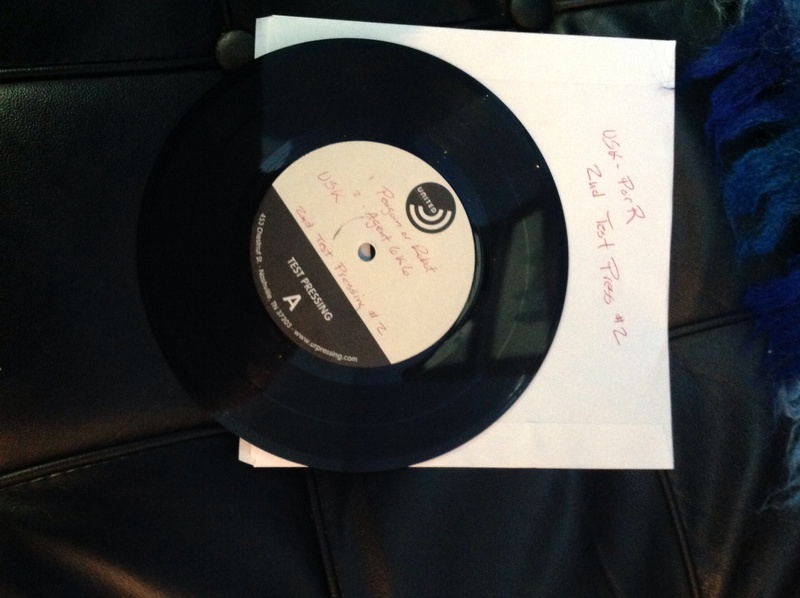 Test pressings are picked up by the fabulous Jeff Senn, and mailed to us. Thanks to Jeff from the Crazy Aces (Nashville) for picking these up and sending them to us! The Masters are done and sound great. Brad remixed Last Chance for Clams with excellent results. 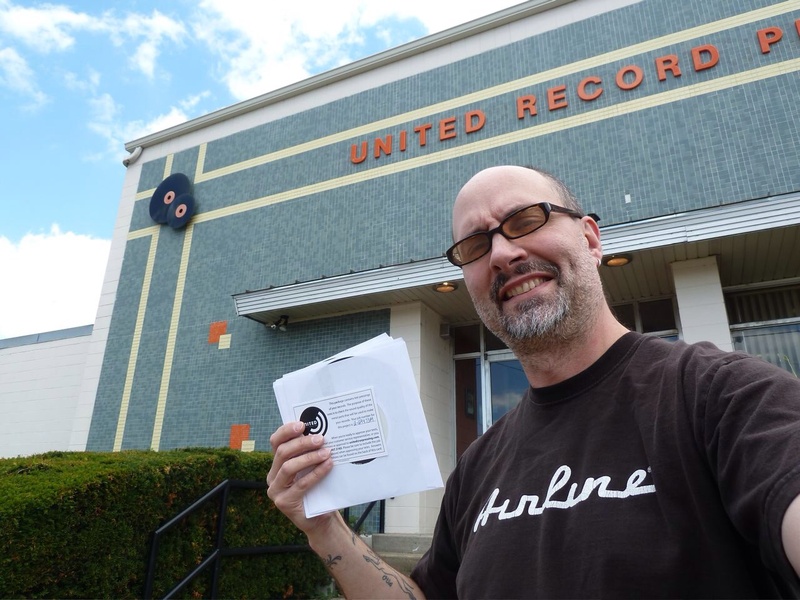 The vinyl manufacturing forms for United Record Pressing are all filled out, and the whole package will be sent south of the border later this week. Woo-Hoo!!! Living with the masters. I would like to take another shot at “Last Chance for Clams” as the bass seems more pronounced on that tune than the others. Just a little tightening up. The other 3 are great! I have gotten a lot of quotes on 500 7 inches with full colour covers. We’ll probably go with United Record Pressing in Nashville for the vinyl (they did a great job on 2 previous releases: el Toro! & Ski School). There’s a place in Montreal that will be doing the full colour jackets called Duplication.ca. The price is right, and they are here in Canada. Now if we can only get someone to press 7 inches up here, we could keep it all in country. As mentioned before, this release is mixed mediums. 4 tracks will be on vinyl while another 4 will be released digitally. The digital tracks have been all mastered today. The vinyl track mastering takes place on Wednesday. And as previously mentioned the, the cover art is A-1. The mastering session is booked for early April (not May as previously stated) at Archive Mastering with J. Lapointe. Getting closer!!! Sometimes things progress at a crawl, but that’s the way it goes. No worries on our part. There have been lots of gigs, travel,renos, unforeseen studio malfunctions, studio relocation due to city bylaw issues, and a pesky tape machine. The cover is pretty much done. The mixes sound great, so the delays were worth it! Set up another recording rig for Clams as I wasn’t as keen on the last guitar track as I thought. Airline Map > Garnet Revolution 2 > SM 57/ MXL Large Condenser. This is the final take. Brad has started transferring to tape and mixing. First the studio was being renoed, now Rev’s kitchen is in a state of chaos. The guitar track will have to wait. Recording Limbo it is! This is the slow part of the recording process. The studio was waiting for a tape machine to mix the recordings down to for some real analogue tape goodness. It came last week. Brad discovered that the guitar track for Last Chance for Clams was wonky, so I have to go in to redo that. The studio is renovating this week, so it won’t be until next week. I saw the artwork tonight. Wow! is all I’m gonna say. My cousin Ellen is a member of a First Nations roller derby team called the Wagon Burners (LOL). This was the inspiration for a new piece for the digital ep included with the 45. It’s working title is Light ’em Up or maybe Circle the Wagons. I emailed the 12 bar rocker to Inky to add his drum magic. The track I sent was just a rough guitar track with synth bass. Waiting to hear what this sounds like. Artists Ed Beals and I went to the Rush concert here in Halifax when he came up with a great idea for a video for Penguin or Robot. Hope we can pull it off. Stay tuned. Went to the studio late afternoon to lay down overdubs for 2 of the pieces. After the proverbial “why am I getting no signal” dilemma I sat down at ye old Farfisa to lay down a keyboard track for Penguin or Robot. The 2nd & 3rd verse needed some padding. Once we tuned the keyboard, it took a couple of takes to find something that sat well and complemented the track. Next up was adding something to parts of Quick Draw Norman. I toyed with a Wulitzer part for a bit, but was not convinced with the results. What it really needed was a galloping acoustic guitar part. I used a cheap Yamaha acoustic sitting around the studio, and played it into a Rode tube mic . A take later the part was laid down, and the recording part of the studio sessions were completed. Now it’s up to Brad to mix the 4 songs, get them mastered elsewhere, send them off to be pressed, plus artwork, etc. The day finally arrives, and we are in the middle of a heat wave. Temperatures are over 30 degrees Celsius outside, and in Brad’s studio (the upper floor of an old Carriage House). No matter, this day has been a long time coming. We arrive around 11AM to get everything miked up, and all the lines checked. Inky decides to use the house kit (Rodgers) with his cymbals and snares, while Crash uses the SWR bass rig at the studio, along with his 5 string Musicman. I have brought along my trusty Vibrasonic Amp, Reverb Tank, Strat and Airline Map. After hanging around drinking coffee, and eating muffins we start to record around 1PM. We all set up in the main studio, with the bass going direct, and my amp in another room (close miked with an SM 57, and a condenser room mic a couple of feet away). The drums are miked bass drum, snare, Rode stereo overhead, and room mic. After some headphone issues we knock this one off in 3 takes. 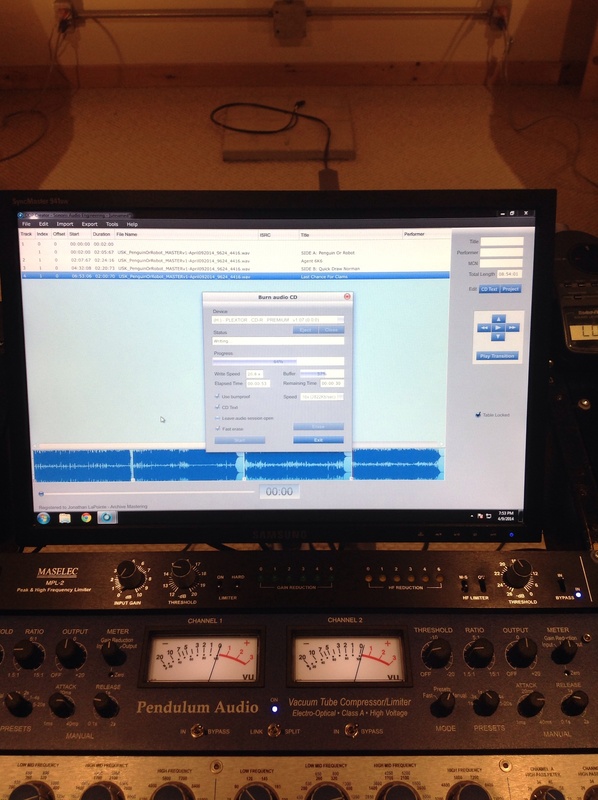 The first takes are always run thoughs, followed by some arrangement details, and minor tweaking. I use my Map guitar with both p-ups on this track for a bit of crunch. I switched to my strat (neck p-up) for this tunes for a different sound. A couple of takes and this one is done. The solo veers of in a different direction than I had planned, but it turns out to be better. This song is the most trad surf of the 4 with some muted picking. Brad’s better half arrives with some home-made ice tea for us, while her phone goes off with a heat alert. It feels like were on stage with a lot of par 64s directly on us. Everybody is playing very relaxed as a result. After a name that tune contest, this song became Agent 6K6 (named after the vacuum tube and the spy-like melody). This one was done in 3 takes after deciding on how many shots were played out of the B section. We settled on 2. Crash played some brand new wild and crazy stuff on this one. We were all shocked, including him. Once again, I used the Strat on the neck p-up. We took a brief break and listened to the new Daft Punk CD. Nile, Nathan & Omar are amazing on this release. Brad tells us about the time Nathan East sat in with his band. Wow! The last piece to be recorded is a spaghetti western type piece, and the one that gave us the most trouble due to the heat. The Map guitar would not stay in tune, so I went to the Stat, but it did not have the sound I wanted. So back to the Map, and tuned and retuned, and retuned… until we got the take. And what a take it was! The plan is to have an edited version on the vinyl with fade, and the full length as a digital version ( I think it went passed 4 minutes). The improvisational ending was on fire. Lots of great playing, and lots of risks. I think we were just so warm that we couldn’t think straight. 🙂 And the guitar stayed in tune! There were several small vintage amps in the studio, so I set up a Garnet Banshee, and revved it up for this tune. Garnets were made in canada, and this one broke up really nicely with the Map guitar (Jason Lollar single coils). The last notes ran out about 3:30PM. We went into the booth and listened to all the tunes with smiles all around. In a couple of days I’ll go back to add some keys and acoustic guitar to fill out a couple of tunes. Great session! Just finished mixing the second digital track, Snow Day (all you cold climate people know what that means!). The Brainworx bx_solo plug in is great for those stereo spreads! One week until we are in the studio with Brad Conrad to record 4 songs. It’s happening. It looks like we’ll be recording in June, as Brad (the studio cat) is one busy guy. Rather than trying to rush the recording (that’s an understatement), we’re gonna wait until everyone’s free and clear. Perhaps a September release for the 45rpm. That’s just the way it goes. We had our second rehearsal and are ready to record. Just waiting to hear back from the studio about available time. The recording should only take about half a day, I figure. We got together Monday night for about an hour and a half to rehearse the 4 studio tunes for the first time. There were a lot of laughs, and “stellar” performances, as is to be expected on some new tunes. I got some great video and audio of the session for the recording movie. Crash used his Ubass, and it sounded great! One more rehearsal, then we’ll head into the studio. I don’t like going to record with the songs too polished, as a lot of pretty cool things could happen when the arrangements are a bit fuzzy. So it’s been a while since the last post as there has been little recording activity. February turned out to be a crazy month for last minute & scheduled gigs which left us no time to record. The highlight was our 18th Birthday Bash at Bearlys’ where we got to play with a bunch of cool people. and one yet to be titled. Just dropped the drum tracks into the Snow Day arrangement, and they are the perfect fit! Can’t wait to put in the guitar track. Crash has the session file for English Monkey and will be laying down the bass in Garage Band at home. We may never have to be in the same room again (just kidding). Ran into Brad Conrad at a gallery show opening, and talked about getting together in the studio this March as he is not available in February. Can’t wait! Tried another amp set up for guitar, and am really pleased with the results: Airline Map Guitar (Jason Lollar p-ups) > Fender Reverb > Kalamazoo Model Two Amp (8″ Webber Speaker). The amp is close miked with a MXL large condenser, and the room mic is a smaller MXL condenser. Did a bit of EQing on the parts, and then a rough mix which I’m really happy with! When I checked my inbox, Inky had sent the drum tracks to the next tune: Snow Day. PS: I am much happier with not only the guitar sound, but also the performance. When I was recording the guitar last week, I spent too much time trying to be clever, and as a result English Monkey was kind of sterile. This week I just played through the song, not worrying about that, and just let it go. Influenced by all those 1st wave teenagers who just played, damn the torpedoes! Now that’s surf! Spent about 2 hours experimenting today with recording the guitar track from English Monkey. 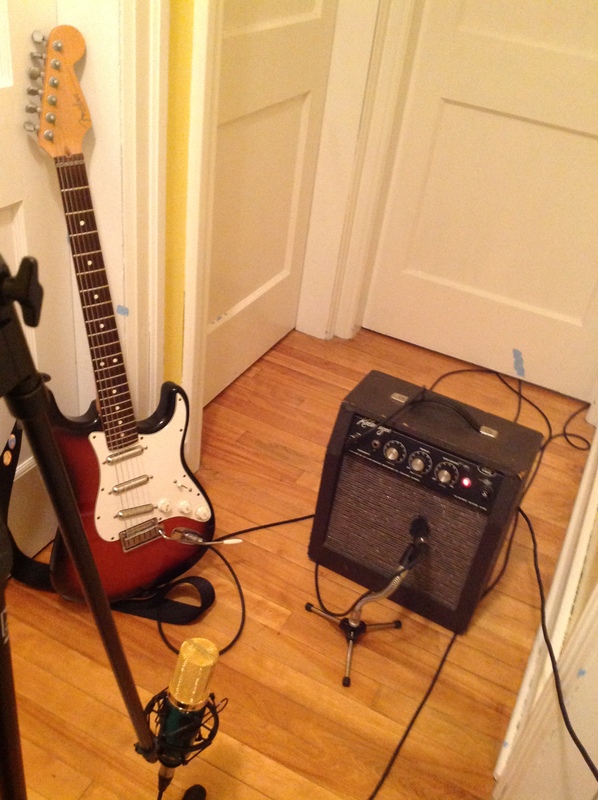 I put my amp in the bathroom, miking it about 2 feet away with a large condenser, and had a room mic in the bedroom. Not bad. More experiments to come with a smaller amp than the Vibrasonic used today…for comparison. Inky is starting to work on the drum tracks. Rehearsal for the studio tracks this Tuesday. update: Just got the first drum tracks, and Wow!!! I finished the scratch tracks for the final 2 digital pieces. Snow Day is a straight ahead surf tune, while Tonga Tango is more “exotic” shall we say. The scratch tracks are being recorded on a Mac running Logic Pro 9. I find that its really a quick way to lay down some tracks using the amp modellers. The final guitar tracks will be recorded the old fashioned way with an amp and mics. Brad Conrad also works in Logic, so any file transfers will be fairly seamless. The next step is for Inky to lay down the drums when he has a chance. He is a busy guy! Recording for the next Urban Surf Kings release began today. The album will more than likely feature 8 songs available in various formats; vinyl (4 songs) & digital (4 different songs) being the current front runner. Call it mixed media, if you will. The 4 digital songs are being recorded by the band, while the vinyl will be recorded by Brad Conrad (Surf vs the Flying Saucers, Live in Hell, Longhorn). I recorded the scratch guitar and bass tracks for English Monkey, and Trans Ural Express. These have been emailed to drummer Inky to lay down his parts. After the drums are recorded Crash will add his bass parts, then Rev will record the guitar parts. The whole process is being documented on video as a companion piece for the album. So it begins again…USK release #12.